Turneffe Atoll Diving — Jaguar Ventures of Belize Ltd.
Turneffe Islands Atoll is the largest of the three atolls in Belize. With over 200 islands making up the atoll there is a tremendous nursery/food chain existing at the atoll and this almost insures marine life encounters. The walls at Turneffe are primarily composed of "spur and groove" formation. The spurs are coral ridges that run perpendicular to the wall and the grooves are sand channels between the spurs. Weather permitting we will dive the East side of the atoll, since most of the wind and weather comes from an easterly, southeasterly direction. Here the spur and groove formation tends to be deeper and wider, with the tops of the spurs averaging 60-65'. In some areas the grooves are as deep as 90'+. 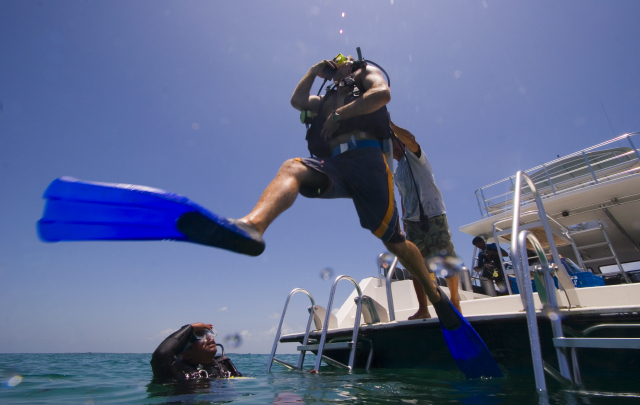 With 70 dive sites on GPS coordinates one can almost be assured the diving of a lifetime.Normally, we do three tank dives at Turneffe and tanks and weights are included in the price of the trip as are lunch, drinks, towels, and water. Computers are welcomed and average bottom time per dive is approximately 50 minutes. We serve snacks and lunch on the boat between dives. There is a shower on the boat to rinse people and cameras, and there is also a marine head.